There's a bit of a 1970s AOR revival going on at Discopop Towers this week. We've had Fleetwood Mac, Credence Clearwater Revival and The Eagles pumping out of out iPod Philips record player. And it feels good, man. 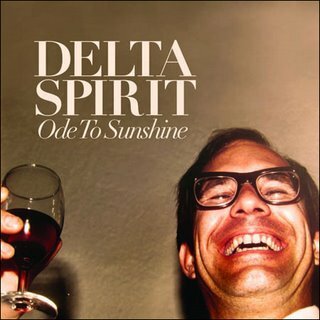 So we were delighted to discover the charms of newly-birthed Californian rock "combo" Delta Spirit. Like The Hold Steady, Fleet Foxes and even The Raconteurs, they've delved into the big old music box marked Americana, thrown on a poncho, grown beards and gone back to the roots of rock. By which we mean they've practiced their blues scales, studied Patti Smith's Horses, and recorded their album "as live" in a log cabin in San Diego. Even their album cover is a brilliant throwback to 1970s dinner parties. Break out the prawn cocktail and Mateus Rosé! Delta Spirit are touring the UK now, and their album is out on 23rd March. In the meantime, here's the first song I ever heard them play - People C'mon. I defy your foot not to tap.